Investors always have to put up hard fight to cope up the niche competition and this year ain’t going to be any different. 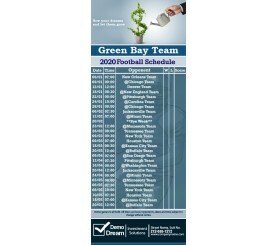 Customized 3.5 x 9 in one team Green Bay Team football schedule Cleveland Browns investment business card magnet help investment services to tackle the competition in sporting spirit. This magnet acts as a powerful match reference token and a promotional token. People will retain it over their refrigerator in memory of this current sporting season, which means your business messages are gonna play on their consciousness.